AFC Rushden & Diamonds rounded off a fine week for the club with one of their best results of the season as they claimed a 4-1 victory at Leiston. 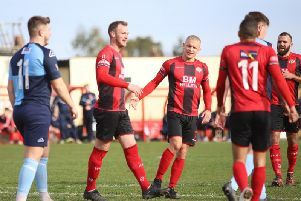 In a week that had seen Diamonds reveal they have agreed heads of terms on an area of land for a new ground, they finished it off by strengthening their grip on third place in the Evo-Stik League South Premier Division Central. Diamonds made two signings in the build up to the game with Alex Collard, a former Kempston Rovers centre-half, and young Oxford United defender Matt Berry-Hargreaves both joining the club. And both started with Liam Dolman and Jack Ashton still ruled out through injury and Jack Westbrook sitting out because of suspension. Diamonds got off to the best possible start when Albie Hopkins slammed home after capitalising on a goalkeeping error. And Tom Lorraine made it 2-0 when he headed home a free-kick just past the half-hour. Christy Finch’s set-piece got Leiston back into it before half-time but Diamonds finished the game off in the final 11 minutes. Ben Diamond headed home at the far post to make it 3-1 and Ben Farrell rounded things off from the penalty spot after Hopkins had been brought down. It was a bad day for Kettering Town as they had Dan Holman sent-off and slumped to a 3-0 home defeat to St Ives Town. Having conceded four against Redditch in midweek, the Poppies’ defence took more punishment again at Latimer Park with the visitors putting the game out of sight before half-time. Despite the loss, Kettering held on to top spot in the Evo-Stik League South Premier Divison Central on goal difference from Stourbridge. And while Marcus Law’s team have two games in hand, their recent dip in form will be a major concern. Former Kettering man Ben Baker set up St Ives’ opener when he scampered down the left and then found Ollie Snaith who fired into the bottom corner. The Poppies felt they should have had a penalty when Lathaniel Rowe-Turner’s low cross appeared to strike an outstretched arm but their claims were waved away. To make things worse, they were soon 2-0 down when Ben Seymour-Shove’s cross was headed home by Sam Cartwright. And it was game over before the break when Danny Kelly stepped up to fire home a wonderful 25-yard free-kick off the underside of the crossbar. Holman saw red for an over-the-top challenge on Charlie De’ath and it meant Kettering were unable to muster up any response after half-time. They did get the chance to pull one back late on when Aaron O’Connor was fouled in the box but, after Rhys Hoenes had missed a penalty in midweek, Ben Milnes followed suit by blasting the spot-kick over the bar. The Poppies will now hope to bounce back in two more home games when they take on Barwell in the CSS Challenge Cup on Tuesday night before they host Lowestoft Town in the league next weekend. Corby Town picked up a crucial 2-1 success at fellow high-flyers Berkhamsted in the Evo-Stik League South Division One Central. The game only went ahead after a morning pitch inspection and it was the hosts who opened the scoring when Elliott Godfrey fired home from 20 yards. However, the Steelmen turned the game around before half-time. Joel Carta knocked home the equaliser following a free-kick and then finished off a free-kick from Sam Warburton to put Corby in front. There were chances after the break with Jordan Francis being denied by the home goalkeeper before Jordon Crawford hit the post after being played in by Elliot Sandy. But the Steelmen saw things out and their cause was helped when home captain Danny Murphy was sent-off for a second bookable offence. The win put Steve Kinniburgh’s men level on points with second-placed Bromsgrove Sporting with both teams remaining five behind leaders Peterborough Sports.